There has been this overwhelming argument of electability that is being made for Hillary Clinton. Not only can electability often become a self-fulfilling prophecy, but in this case, it is steering the Democrat establishment in the wrong direction. I'm going to state something that few will consider. The truth is Bernie Sanders gives the Democrats a much better chance of winning the presidency. Let us consider for a moment, that in almost every past democratic presidential primary since 1960, the late bloomer won the nomination. In other words, the winner was far from obvious at the beginning of the primary. Democrats, and the general population like the underdog story. Still, there are those who will say the socialist label will make it impossible for someone like Bernie Sanders to be elected. However, it should be noted that few felt Kennedy could be elected as a Catholic, and many were skeptical Obama could be (only 54% felt America was ready for a black president in January, 2008). Furthermore, the Bernie's socialist label does not mean Hillary is such a superior candidate. For example, one thing that has predicted winners of general elections since 1992 is likability. This is something that Hillary lacks, and this probably won't change any time soon as several decades in the national spotlight means most of us have already formed one opinion or the other of her. The Democrats are mistaken when they stubbornly insist Hillary is easily the best shot at winning a general election. This is what the Republicans told themselves when they kept advocating for Mitt Romney. The party may love them but the people that vote don't. Some will remind us that Hillary's favorability with Democrats is still high but what does it matter if her favorability with registered Democrats remains strong? Do we not assume that this group will vote for any candidate that represents the Left? We will get the blue states regardless. It is the independents, the young and the swing states that are home to many unions that matter in the general election. Her reluctance to oppose the TPP agreement, her prior record of supporting NAFTA, the polarizing feelings she invokes, her lack of charisma, and the baggage that comes with her (e.g., the email scandal) makes her a weak candidate in the general election. In addition, her ties to Wall Street, her inauthenticity will be an issue when we try to win over the Rust Belt and other places that are home to the working-class. Hillary Clinton will not be able to repeat Obama's coalition because she does not have his likability or charisma. This election cycle has demonstrated that voters crave for someone that is not a moderate or seen as a member of the Washington establishment. Hillary Clinton is the wrong candidate for this time period. In addition, the Republicans will give us sound bites of every time Hillary has flip flopped, as well as policies she and her husband have endorsed that hurt minorities. For example, she once stated she is adamantly against illegal immigrants and was against providing them with driver licenses. This may not turn many Democrats into Republicans, but if it even changes a small number to vote differently, or causes some to not vote at all (the latter is what I would predict), the consequences could be dire. In fairness to Hillary Clinton, I do not envision anyone to repeat the turnout Obama had with minority voters. Nevertheless, the Democrats will do quite well with these groups regardless of who the candidate is. In contrast, Bernie Sanders may be able to form a very scary coalition. Democrats are mislabeling Bernie Sanders as a Howard Dean type that appeals to only elite progressives but he has the potential to expand his base in a way Dean never could. For instance, Bernie Sanders is not just resonating with the youth (a group that we will definitely need to win in 2016) but he is actually adored by unions. We are miscalculating when we simply say he is a far leftist from Vermont. This is a candidate that could win over blue-collar workers in the Midwest because he is loved by unions. At the same time, he is still able to maintain a huge following from Eugene McCarthy liberals and environmentalists. This is a candidate that is well-liked by Noam Chomsky yet has a movement that is also fueled by military veterans. He can appeal to the elderly by portraying himself as an FDR type Democrat who fights for cheaper prices for medications, and expanding Social Security. He can appeal to the independents and conservatives by being seen as an outsider that doesn't want a Super Pac. He can appeal to the black community by stating his past history as a Civil Rights Activist. He can appeal to the Hispanic community by discussing the fact that in 2008, he traveled to Florida to meet with exploited migrant workers and did all he could to assure better working conditions for them. He can appeal to the LGBT community because he has been showing his support for full gay equality since the 1970s. He can appeal to female voters by displaying his consistent record on women' rights. Imagine a candidate that that attracts minorities (Cornel West and rapper Killer Mike would not have endorsed him otherwise), while still attracting working-class voters, independents, and first-time voters. 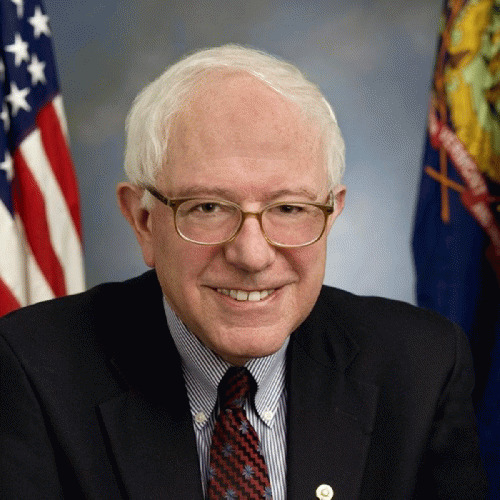 Bernie Sanders could easily form a very powerful coalition that no Republican could defeat in the general election. In regards to the socialist label, people do not realize that when a candidate has a certain kind of indescribable appeal, they can overcome any scandal or label that they are associated with. The socialist label will not hurt Bernie Sanders so much because when you are liked, and have a certain halo effect, voters are willing to look the other way. John F. Kennedy's likability convinced Americans to vote for him despite his Catholic faith. Bill Clinton remains one of the most popular American figures despite the fact he committed adultery and was even impeached for perjury. When a politician has this elusive quality, they remain invulnerable to any scandal or label. The email scandal will hurt Hillary Clinton but not because what she did was egregious, but because we didn't like her very much to begin with. We are already starting to see flaws in this electability argument. Despite all of her endorsements and all her money, Hillary is not dominating in national polls against an unknown 73 year old socialist that has little money to speak of, and hasn't even released a negative ad against her (nor plans to). Nor can we overlook the fact Bernie is now beating Hillary (or is highly competitive) in New Hampshire and Iowa, which no one seems to realize in the media, happen to also be key swing states in the general election. These are all troubling signs for our party. Does this sound like a candidate that is easily the best bet for the general election? In 2012, the most damaging thing the Republicans did was choose Mitt Romney in an election that revolved around the battle between the 99% and the 1%. For the life of me, I could not understand why the Republican Party thought that a person who had 1% written all over him would beat Obama. Let us not do the same by picking a candidate with a similar reputation when the theme of the next election will remain the same. Bernie Sanders gives us a personal narrative a campaign strategist desperately craves. The Clinton campaign has a tough time selling us a personal narrative because she grew up in a very affluent neighborhood, and didn't experience adversity in the way past candidates like Bill Clinton have. Perhaps you can argue that we tried the Bernie experiment with McGovern and lost because they were too far left. Of course, we are fooling ourselves again with these arguments as history shows us that any candidate would have lost, considering that the economy was booming, and fatalities in Vietnam were dwindling in 1972. The counterpoint can also include the fact Humphrey lost in 1968 despite being a more established candidate. Let us also not forget the history of the word electability. It was an argument used against Jimmy Carter yet he was the perfect candidate in that time period. It was an argument opponents used against Bill Clinton in 1992. Hillary Clinton's team used this argument against Obama in 2008. Ironically, it was an argument opponents used against Hillary Clinton herself in 2008. The argument of electability has been used frequently but history has shown us that it often lacks any validity. When we choose not to vote for Bernie Sanders, simply because we feel he is unelectable, we may actually be left with a candidate that is less electable.